I love the pack the In-Salt comes in the clear reusable pouch means you can see what your product, how much is in the bag and its easy to reseal and keep fresh. 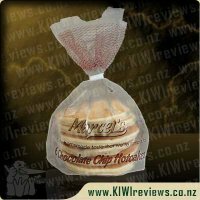 I was surprised how easy it was to open up and once I teared of the first top of the bag I could already smell chocolate straight away and the bag was sealed up. I was excited to open the bag as I knew it was going to be amazing. As soon as I opened the bag up I could smell the chocolate even stronger. Yaye it was delicious and I was looking forward to using it. I turned the bag over as I wanted to read the ingredients and see the nutrition as I am all about reading labels. I was rather bummed out to see it had no nutritional information on the pack so I had no idea what the levels were, so I decided to look it up on there web site. Nor did the web site give me any of this information that I was looking for which was disappointing. 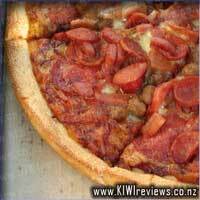 However the ingredients used were there so I had a idea of what was in the product. I got my partner to try this one and he loved it. He has a super sweet tooth and loves his snacks and sweets. He decided to have this over ice cream to start with which he shared with my son and the two of them raved about how yum it was. They both decided to experiment over the next couple days trying it with different things, They made some mini banoffee pies and sprinkled this with the whipped cream as the topping and said it was amazing and they say they want to make this again. 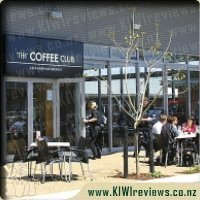 They both said you get a good amount of flavour from the salts and feel the price is reasonable for the product and say they will be telling their friends about it and adding it the shopping. So if you were creating a match made in dessert heaven, a touch of salty alongside the sweet would sit pretty high on my list. I have long been a fan of eating a crisp with a piece of chocolate (don&apos;t judge me until you&apos;ve tried it), so I know how good the combination of chocolate and salt can be. This is why I was so excited to see this salted chocolate sugar from In-Salt, and very very excited to receive a pack to review. The first thing that I had to do when I received the pack was have a look at the ingredients. 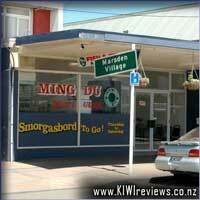 I was very pleasantly surprised that it was really short, and I knew what everything was. Such a bonus to have a &apos;real&apos; product like I might make myself (if only I had that amount of time). Tearing open the pack, I was really pleased to note it was resealable- ensuring that the sugar and salt didn&apos;t go soggy too quickly. The pack is an especially generous size, so this factor will be hugely important in getting great quality right to the final use. The first thing that you notice when you taste the product is the beautiful sweetness alongside the subtle rich chocolate flavour. Then the salt kicks in, giving just a hint of a savoury note. Having been lucky enough to try one of the other In-Salt products, I knew I was in for a treat. Once again, this is perfectly balanced, not overpoweringly salty but not so sweet that the chocolate or salt is lost. I immediately thought of some dishes I could use it in or on, such is its versatility. The first recipe I tried was my chocolate slice. I added the salted chocolate to the base and as a sprinkle all over the top of the slice. The combination was perfect- still sweet but with that beautiful savoury contrast which makes you keep reaching for more. After that success I also tried it on a chocolate pavlova whipped into cream. This was light, dreamy and so tasty. I also tried a sprinkle within a chilli con carne. 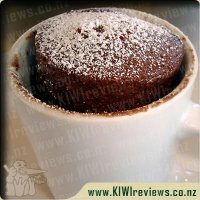 The sweetness and caramel notes really blended well with the chilli and chocolate to make a beautifully different version of a family favourite. Overall, I am once again blown away by this In-Salt product. So versatile, so useful and just so delicious. I would not hesitate to pick this up again as I know it would have so many uses. Try it- you will not be disappointed. Salty and sweet in the right combination is delicious but I hadn&apos;t tried any salted chocolate yet so I was eager to give this a go. 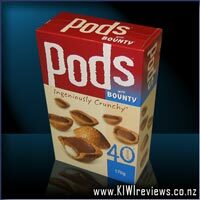 My initial thought about this was that the packet is resealable which always comes in handy and keeps it fresher longer. The front is nice and simple and I like being able to see the actual product that we&apos;re getting, the back provides the ingredients, some ideas for use and most of the information you would expect except for the nutrition information and the weight of the packet (which is an important factor for me as I&apos;m always comparing products and pricing, so no weight on this would put me off). Opening it up all the kids wanted to dip their finger in and give it a try, all declaring it yum and wanting me to tip a small amount into their hands. My first use of this was with a cheesecake, I made a nice simple vanilla one as I wanted to see how the salted chocolate would go with it and it did not dissapoint. I did put just a small amount on my first slice, which added a nice subtle flavour so with my second slice I put quite a lot on and then the flavour really popped and added some lovely flavour to the cheesecake and I still had a nice amount of mixture left in the bag. I then made a chocolate brownie with some vanilla icing on top and a liberal sprinkling of the salted chocolate and every agreed that the salt mix made the brownies taste so much better. Last but not least I decided to dampen some soft Dutch licorice and roll it in this and the combo was delish. I still have just under half a bag and the kids are busy coming up with ways to use this, definitely a hit in this house. 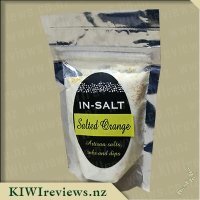 I first saw the In-Salt range of artisan salts, rubs, dips and salted sugars on the KIWIreviews Facebook page and thought they looked intriguing. 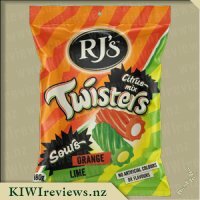 When I went to the KIWIreviews website and saw the various flavours I was overwhelmed by the choices. There were 6 different flavours available including : Coco-loco, Fusion, Rosemary and Lemon, Salted Espresso Sugar, Salted Orange Crunch, and the one I requested was Salted Chocolate Sugar. I chose to request this one as I thought it could be quite versatile. The serving suggestions included mixing through whipped cream or yoghurt, or sprinkled over cakes, ice-cream and drinks. When I first saw the packaging I was impressed with the simplicity of it. 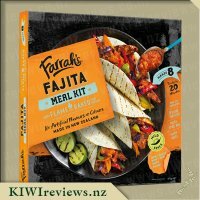 A foil packet with a large window in front to see the product, stuck to this was an oval sticker with the brand name and flavour.The fact that they have made the packet resealable really appealed to me as I didn&apos;t think I would use it all at once. 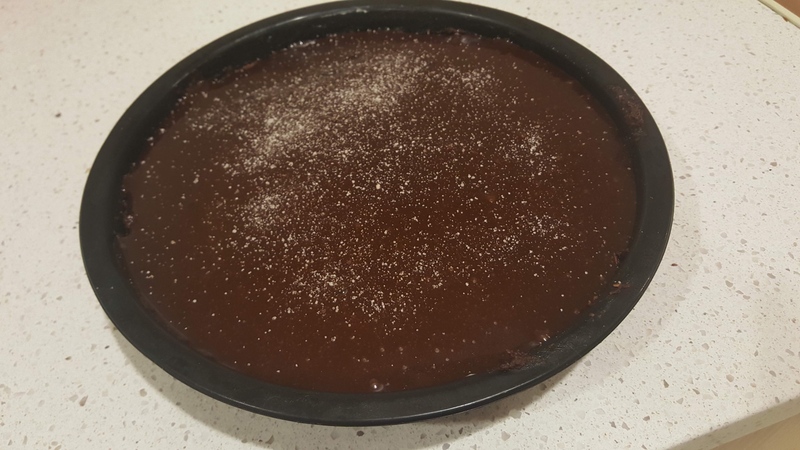 The Salted Chocolate Sugar mix looked delicious with the contrasting colours, and I knew how I was going to use it first - on top of chocolate icing on my banana cake. The packet was easy to tear open from the indent bits at the top, once opened the smell was captivating and there was no mistaking the chocolate smell. I lightly dusted the top of my chocolate icing with the Salted Chocolate Sugar and it looked divine. When it came to the taste I just couldn&apos;t get enough! 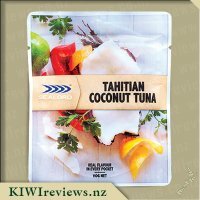 The mix of the product is good, just enough crunch an texture from the organic flaky sea salt. I am very impressed by this product and realise after tasting it just how versatile it will be. 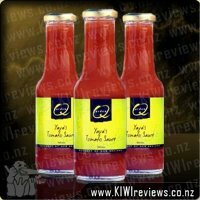 This is a delicious product that has been handcrafted right here in New Zealand from local ingredients. 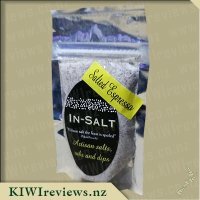 I am eager to try the other flavours that In-Salt has to offer. 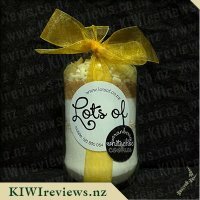 I love salted chocolate goodies so I was looking forward to using In-Salt&apos;s Salted Chocolate Sugar to create some magic! The Sugar comes comes in a small resealable foil bag with a clear front so you can see the sugar. No where on the bag does it say how much it weighs (I tried some before thinking to weigh it!) and although it doesn&apos;t bother me, there is no nutritional information on the pack either. If you look carefully, you can see the milled sugar, cocoa solids and organic flaky sea salt and it looked yum. I did the &apos;dab&apos; test and the chocolate and sugar were the most prominent flavours but there was a subtle saltiness that came through at the end. The packet suggests that you mix through whipped cream, yoghurt or mascarpone or sprinkle over cakes, ice cream, desserts and drinks. 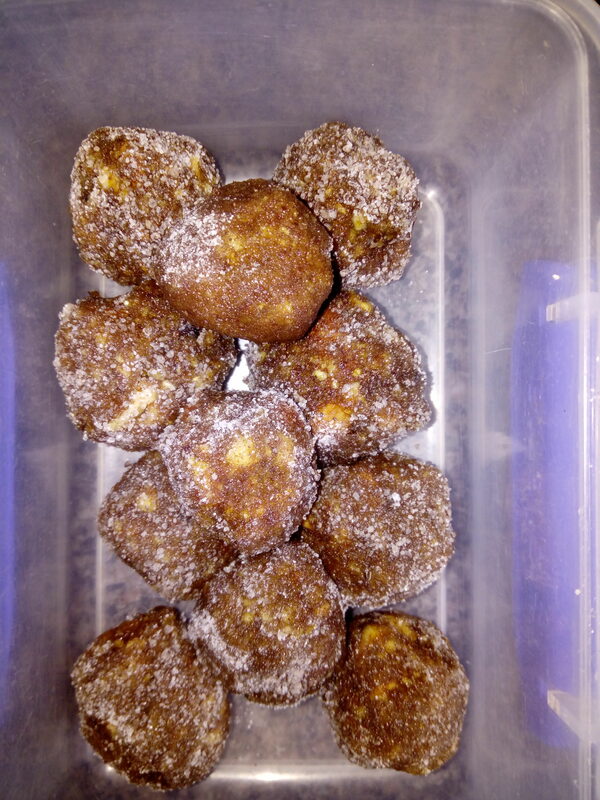 I decided to ignore that advice and make some almond and date bliss balls and roll them in the sugar. 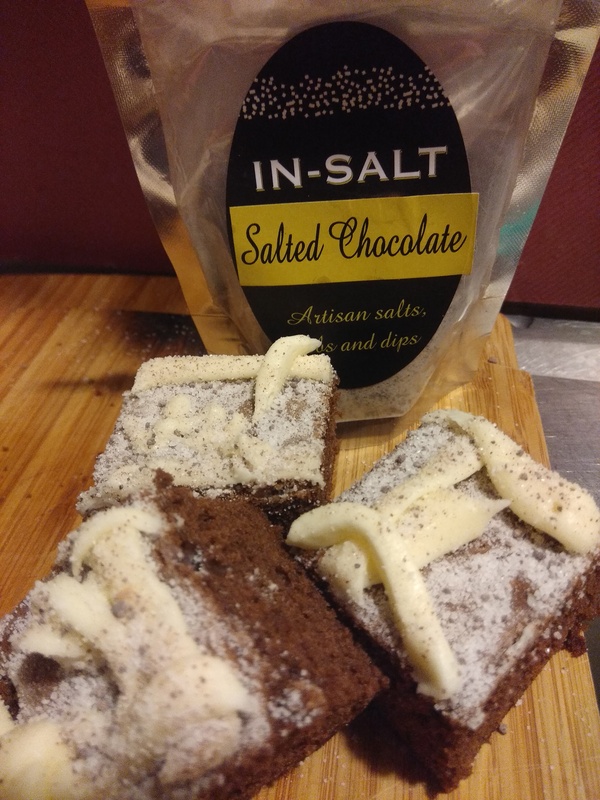 I have to admit, this was the perfect combination and the salt in the Salted Chocolate Sugar was more prominent and prevented the bliss balls from being too sweet. There was a subtle chocolate taste but overall, it was delicious and even my date hating daughter wolfed them down! After this success I decided to try it with some vanilla ice cream and OMG, it was fabulous! The sugar gave the ice cream a lovely crunch and there was an exquisite chocolate saltiness that transformed an ordinary ice cream flavour into an extraordinary one! The Salted Chocolate Sugar is so versatile and considering it can instantly transform a dish, is worth it&apos;s weight in gold! If you love chocolate and something a bit &apos;different&apos; I recommend you try this today. I will definitely be purchasing this again as it was a big hit! 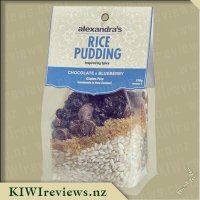 When I requested this product for review I have to be honest and say I wasn&apos;t 100% sure quite what it was that I was requesting, though after reading the back of the packaging it sounded very much like something I would enjoy and something which I could find 101 uses for after all I love baking and desserts, the flavour of salted chocolate interested me the most mostly due to the fact that I have grown to absolutely love salted caramel flavoured products in recent years. The packaging itself I found was quite small, but it did seem to pack a lot of product into it. 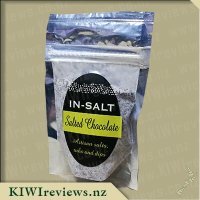 I loved the silver foil like packaging with the clear see-through front where the label sits so that I was able to see exactly what was in the pack, it looked like exactly what the packet suggested, salted chocolate as looking through the pack I could see salt (and sugar) and cocoa. The packaging was easy to open as there was a cut slit near the top to pull across and best of all it is resealable which makes it super handy. My initial thought upon smelling the product was that it reminded me exactly of very dark chocolate as it had an intense chocolate scent to it. 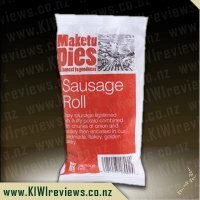 I wasn&apos;t to sure how much of the salt to add to add to my dishes I decided to try it on as this is not stated on the packaging so it was a bit of a trial and error, I choose to add a little bit at a time until I felt that I had achieved the desired taste I was after. The first time I tried this was in a pottle of vanilla flavoured yoghurt with some orange juice squeezed into it, I added about half a teaspoon of the salt which seemed to be about right for its intended purpose and I was impressed by the taste of jaffa it created, it was very yummy, however I didn&apos;t seem to notice any sign of a salt like flavour. I tried the salted chocolate sugar again the next morning when I was making hot chocolates for my family to go with breakfast, after making up the hot chocolate drink, I added a sprinkling of the salted chocolate sugar and some mini marshmallows to the tops. The sugar slowly began to dissolve due to the heat which left a chocolate layer on the surface of the drinks, there wasn&apos;t a lot of flavour provided but it was a nice touch when your lips first touched it and got the most taste of the sugar, next time i&apos;d probably add this to the drink itself in place of normal sugar. With still a lot of the sugar left in my little bag I can&apos;t wait to play around with it some more, in different recipes as i&apos;m sure in certain dishes it would have a stronger flavour. A creative product with a endless amount of uses.